Four member band PaperBagLunchbox (PBL) originally formed in 2001 in Japan’s Osaka area. With the groovy sounds of their bassist and drummer, the haunting vocals of Nakano Yousuke plus Tsuematsu on keyboards they went on to catch the ears of many a live audience. Their EP “BLEP” was released in 2006 followed quickly by their 1st album “Headphone Town”. The album received a storm like reaction leading to performances at various live events including a show at the famous Shibuya AX in Tokyo. However, after such a good start, the days and months passed until it had been 5 years since they had released any new music. When things looked to be over, the band managed to revive itself in 2010 and is going all out with their 2 album “Lost&Found ~2006-2010~” which can be bought from their website. 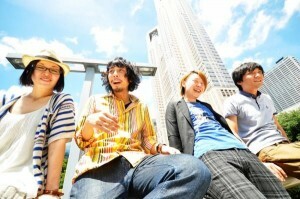 The band is currently on tour around Japan promoting their 2nd album and a 3rd album is in the works for 2011.